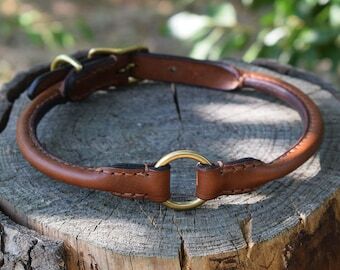 Laced dog collar with stainless steel oval buckle suitable for medium size dogs, made from a 1" (25 mm) wide leather strap (veg tanned english bridle leather) and entirely handmade and handstitched in Italy in the traditional way. The one in the pictures is made in black leather with London tan lacing and lining, please check the last picture for full colors list. The order form consents to specify only one color and that refers to the main strap. If not specified in the order notes, I will use the same color also for the lining and the lacing. Please use the order form's note field for requesting a different lacing & lining color at no additional cost. 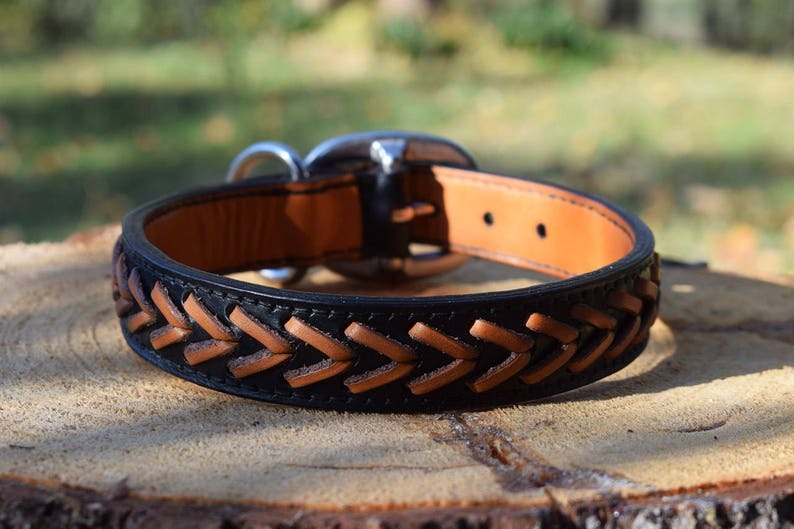 This item is CUSTOM MADE at the exact length for your dog, please check the measurement guide in the pictures to take the measurement from a collar currently in use: this will be the measurement of the new collar adjusted at its central hole of 5, the distance between each hole is 19 mm (3/4"). 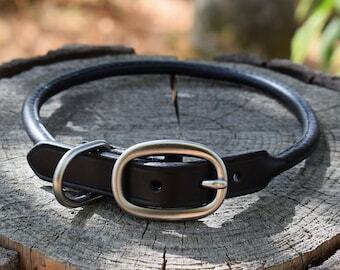 If you don't have a collar, you can measure your dog's neck with a tailor measuring tape just behind the ears. Please specify in the order notes if your dog is still a pup (in case of puppy I will put the measurement on the 1st hole to maximize the useable length). About the buckle: I have several models available, please check the pictures for the full list and specify the corresponding letter in the order notes. If you don't indicate a preference I will proceed with the buckle model shown in the 1st picture. 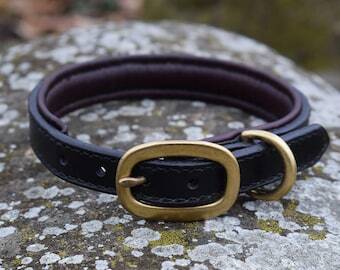 I will be able to ship the collar within a week from order. I can ship it worldwide with registered mail. XL is over 25" (63.5+ cm). 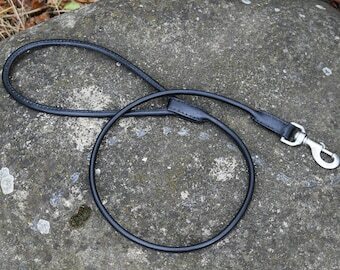 Please check my other listings or contact me if you need this item in a different size. 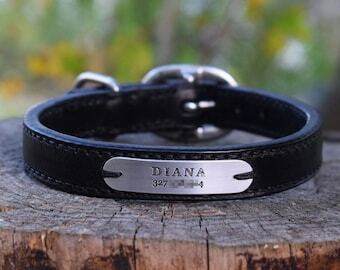 The collar for my pooch is PERFECT! It is hard to see with his crazy hair but so I haven’t tried to take a pic yet. Maybe I will later. It is very well made, quality material that will last. 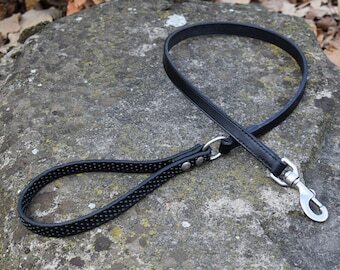 It’s perfect to put his ID tag on and also great for sliding his bow tie on it for when he wants to get all fancy. Thank you so much for a beautifully made quality product. There was a small wait for it since it had to ship around the world and clear customs, but it was completely worth it!! I accept all the Etsy Direct Checkout options: bank transfer, PayPal, credit cards, ApplePay, etc. Orders cancelled within 24 hours from placement will be refundend as follow: 100% refund. Due to the custom nature of my creations, orders cancelled after 24 hours from placement will be refunded as follow: 50% refund. If you're not happy with your item you can ask for an exchange. In any case, buyer is responsible of both return and re-shipping charges. Registered mail rules: it's reasonably fast, pretty secure (as trackable) and economic. Never had troubles with that. I ship from Italy, orders outside EU may be subject to custom duties: these are a buyer responsibility. I can make wholesale discounts for orders of 5+ (or 2+ for some items) pieces of certain articles. Drop me a line and I'll send you an offer. I grant a 12 months (24 months for EU customers) guarantee over all my creations for production or material defects, just send me back the defective item and I will repair it if possible or substitute it with a new one: buyer is responsible for both return and re-shipping charges, I'll repair or substitute the item for free.